Magical spot: beautifully renovated Cottage with lofted bedrooms sleeps four. This property is newly refurbished and elegant when you walk in, boasting 10 foot ceilings, a fireplace and an enticing staircase leading to the lofted second floor. It also features hardwood floors, three skylights and the lofted bedrooms that make this destination a one and only tribute to New Orleans, the Marigny, Frenchmen Street and the French Quarter. This picturesque hidden gem is for Mardi Gras people, friends who want to party in the 'Big Easy', couples, and a great spot for a guys getaway or girls retreat. It sits within the gated property of an ornate 1800's Victorian Home and it is on the National Registry of Historic Properties. The neighborhood is blossoming with coffee shops, cafes and unique retail shops. If you go one block to St Claude St you have a bustling area with: karaoke, brass Bands, jazz and music of all kinds with four bars and clubs within that block of Marigny and St. Claude alone. A couple blocks down St Claude is St Roch's Market with all types of food and shops including a wellness center. New Orleans has it all: SuperBowl, Final Four, Saints, Pelicans, Mardi Gras, Jazz Fest, French Quarter Fest, VooDoo Fest and Southern Decadence just to name a few. We are from New England with ties to New Orleans. Our cousin lived here for many years working at LSU. Our youngest daughter attended Loyola University, graduating just recently and now working on a PHD in chemistry at Boston College. This gave us a good reason to come down and visit. We fell in love with New Orleans at first site: the music , the people , the food and our properties! The fact is, the people here are just great; so hospitable and welcoming. The experiences we have had here are heart- warming. Since our kids have all moved out we now have two dogs and other animals. The last addition to our household is from New Orleans himself, a sweet mix breed that we adopted from the street. He is a gentle, beautiful dog you see in the photo of the property! You don't have to worry though if you're not a dog lover, he is not at the Marigny street property, he is home with us! We pride ourselves on having guests enjoy our property here. If you choose the "Painted Lady Cottage" you would have made a great decision. It is a clean NOLA style cottage with art and a homey feeling. It's a great little place with a lot of feelings and it will inspire you to love life and be yourself. It's an Historic Property close to everything. It is the cottage behind the estate home called the "Painted Lady" on the National Registry and a landmark for New Orleans. Many visitors stop by just to take pictures of the beautiful Estate home which leads to the cottage around back of the estate. The Cottage is small with open lofted area and staircase that accents it's beauty. Plus, New Orleans speaks for itself: Great night life, shows, tours, entertainment, sporting events, The Garden District, Bourbon Street the French Quarter and Frenchmen St. With all the goings on here: Mardi Gras, Jazz Fest, Southern Decadence, the grand Mississippi River, Jackson Square, The Super Dome, Sugar Bowl, Super Bowl and Final Four, The Saints and The Pelicans, Golf, Fishing, Parades, Parties, People; plus, Tulane and Loyola... it's the best place in the USA for a good time! Also, along the Mississippi at Jackson Square are horse drawn carriages and Café Du Monde, the home of the beignet. Location, location, location and the location is simply fantastic: if you walk one block to St Claude you have jazz clubs, big bands or street performers and restaurants galore usually Cajun style, if you can handle it! If you go the other way, on Esplanade, there is The "Port of Call" restaurant or a bit further toward the Quarter you may run into a marching band or a corner quintet or a solo guitarist. They are all great and at all times of the day or night. Don't forget the neighborhood cafe and coffee shops that are everywhere. Just west is the Garden District, not far away either. Hop on the trolley at St Claude or take a cab or Uber and stroll down the magnificent St. Charles Ave. and visit the many elegant mansions, shops, hotel bars and diverse restaurants. And while there, don't forget to visit Magazine Street, another popular hangout for a great shopping, dining and entertainment experience. Continue along the trolley route to Audubon Park, the Golf Course and the Zoo. Here you will see the great architecture of Loyola and Tulane Universities. Tour the mansions neighborhoods to get another view of early 1900's New Orleans history and the Garden District. The Homes over there are spectacular, to say the least! toilet, shower, Plenty of towels and linens available. full bathroom with stand up shower stall; towels and linens provided. This property has all you need for your visit to New Orleans. It is walking distance to Frenchmen St for local music, food and great entertainment. 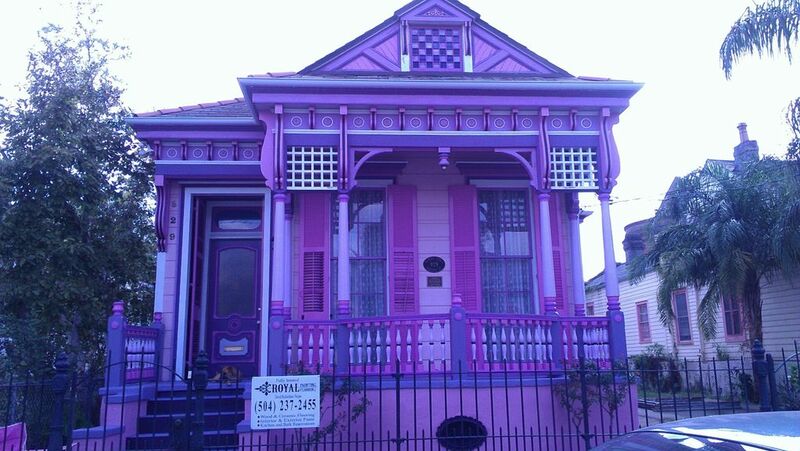 Walking distance to French Quarter and the famous Bourbon Street. Walking distance to Mississippi River and French Market shopping. Best location in New Orleans! Closest corner is Marigny St. and Rampart St. next to the OLD TOWN INN! We loved this cottage! Super comfortable. It has everything you might need for a perfect stay. Quiet and friendly neighborhood with coffee shops and restaurants nearby. Great music within walking distance. We will be back! Situated in the Marigny a block and a half away from St. Claude, Debra and James’ cottage was the perfect home base for our New Orleans sojourn. The cottage is not the one pictured but a guest cottage behind the main house. A (well-worn) courtyard and front porch are a charming addition to what is essentially a spacious studio apartment. The upstairs sleeping area with two double beds separated by the stairway is lacking in headroom or privacy, but that wasn’t a big deal for us. The apartment was clean, well-appointed and the owners were responsive throughout our stay (and after). This is a terrific neighborhood for walking. In a town where parking can be a real hassle (and expense), the free and easily accessible parking was a nice perk. Would stay here again. We really enjoyed this adorable little cottage! Everything you need is there! Clean, colorful, and quiet! This residence is one block to Elysian Fields and another two blocks to Esplanade. There is public transportation one block away at the corner of St Claude and Elysian Fields. The cottage is only 2 blocks to Frenchmen Street with many restaurants and music establishments and another 3 blocks to the French Quarter. Many nights you will actually see live brass bands playing on the street at Frenchmen St.
On Frenchmen Street there is an 'art gallery' for all your Nola treasures and your shopping pleasure. It is also about a ten minute walk to Bourbon Street! The Super Dome is 2 miles and the Garden District about 4 miles. This is a great place to come for Tulane and Loyola graduations! Louis Armstrong Park is only about 1/2 mile walk. The Mississippi River tours are just a short walk away along with Harrah's Casino and the famous Café Du Monde and the Original French Market coffee stand. Additionally, Canal street is a bit further up which runs into Bourbon Street and the Parade routes. There are coffee shops, local bars with entertainment and some of the best food New Orleans has to offer. Decatur Street is the place for some of the best seafood around. Enjoy the street music daily which is an integral part of the home of Jazz music, New Orleans! There is also a horse race course 3 miles called the Fairgrounds. Rates are based on up to 4 people per night. Additional guests are charged $25 per night, per person. Rates are subject to change until reservation is confirmed. Unless arranged otherwise, check-in is 3:00 PM and check out is 11:00 AM! Cancellation Policy: 100% if canceled 30 days prior to arrival date.